Member of NOFA/Mass Northeast Organic Farming Association. 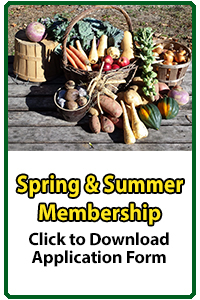 Westfield’s first USDA Certified Organic Farm CSA (Community Supported Agriculture) program, Yellow Stonehouse Farm is a 79 acre property located in both Westfield & Southampton Mass surrounded by a Natural Heritage & Endangered Species Landscape. The Manhan River divides Yellow Stonehouse Farm creating a beautiful environment for growing certified organic vegetables and flowers, while coexisting harmoniously with native wildlife. We cultivate over 17 acres in Westfield for our certified organic vegetables and flowers for CSA shareholders which will range over the entire growing season using organic farming practices. On the 24 acres located in Southampton we are maintaining an extensive vernal pool area, a stand of 200 year old Beech trees and field full of milk weed to help the Monarch Butterflies who visit every year. We are a chemical free farm and do not use any GMO’s, chemical pesticides or herbicides. USDA organic certification is the only system of food labeling that is subjected to independent review, assuring consumers that toxic, synthetic pesticides used in conventional agriculture are replaced by management practices focused on soil biology, crop diversity, and plant health. This eliminates harmful chemicals in the production and handling of food denoted certified organic – pesticides and herbicides that contaminate water, soil and air, harm farmworkers, and kills bees, butterflies, birds, fish and valuable wildlife. A limited number of shares (CSA Pledge/subscriptions) are available starting with a Weekly Full Farm share (WFFS) or an Every Other Week Full Farm share (EOWFFS) covering 20+ weeks during our growing season early June through late October and our Winter share starting in November running until early February. All shares include Pick Your Own (PYO) garden access, flowers and use of our picnic areas located alongside the Manhan River (in season by reservation). We grow a wide variety of crops in abundant quantities including Snap peas, Beans, Cherry Tomatoes, Bok Choy, Peppers, Corn, Sunchokes, Cucumbers, Ginger, Turmeric, Squash, Lettuce, Heirloom Tomatoes, Herbs, Kohlrabi and Sunflowers. Pickup days are Wednesday, Thursday, Friday, and Saturday. Our Full Farm shares are generously sized to feed at least 4 and some vegetables will be sold in an open style Farm Market. Surplus vegetables may be donated to local area organizations. Yellow Stonehouse Farm CSA is just 1.4 miles off rte 10 at the intersection of North Road and Root Road in the East Farms section of Westfield.